- Sagrada Família: The Sagrada Família, designed by the popular architect Antoni Gaudi, is one of the most important landmarks of the city. The church is currently under construction and will continue for at least another decade, but nowadays is the masterpiece of catalan modernism. - Parc de la Ciutadella and The "Born": The Parc de la Ciutadella is Barcelona's most central park and is located at the northeastern edge of the old town. The park hosts the municipal zoo, the Catalan Parliament, a lake, a large fountain and zoology and geology museums. Next to the Park, there is the neighbourhood of the "born", one of the oldest parts of the city that have some of the most interesting Bars, restaurants and stylish boutiques of the city. Besides this, there are popular places such as "Santa Maria del Mar" church. - Parc Güell: Park Guell is one of the most impressive public parks in the world. This municipal garden, was designed by Antoni Gaudí and under construction from 1900 to 1914, and it is one of Gaudi's most colorful and playful works. Inside the park there is the Gaudi House Museum. The two buildings at the entrance or the giant ceramic dragon are some of the most impressive buildings on the park. - La Rambla: La Rambla is the boulevard that connects the "Plaça Catalunya", a busy square in the most comercial area of Barcelona, with the Columbus Monument and the sea. La Rambla is the most famous street in Barcelona, and is often crowded by tourists and locals. There are some popular sites of the city, such as: La Boqueria (an impressive market), Palau de la Virreina (barroque palace) or Liceu (Barcelona's opera house). - Montjuic: The Montjuïc is a hill located near the center of Barcelona, the top of the hill is relatively flat and overlooks the harbour and the southwest of the city center. In Monjuic there are a large number of attractions including the Castle of Monjuic, the Olympic Stadium and Museum, the Spanish Village, the Magic Fountain and the MNAC, one of the city's most important museums. - FC Barcelona Museum: For all those soccer fans, the Barça Museum should be visited. The Barça Museum will allow you get to know Club's history and understand the values that make FC Barcelona "more than a club". 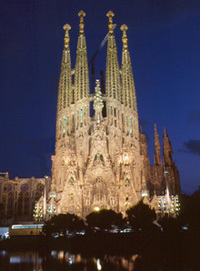 The sights listed above, are just some of the sites that are in Barcelona. 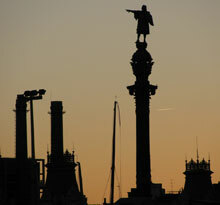 We recommend you to take a look at Barcelona guides to enjoy the city fully. - Montserrat: Is a mountain top monastery in Catalonia, located 40kms far from Barcelona. Situated in the top of unusual rock mountain, it is very popular among Catalans. Catholic pilgrims come from far and wide to see the Black Madonna. More info. - Costa Brava: Is the coastal region in the northeast of Catalonia, starting in Blanes up to France. The combination of nature, good climate and incredible beaches and coves makes this place unique. There are several touristic towns such as Tossa de Mar, Lloret de Mar, Cadaqués (in Port-Lligat, where the house of Salvador Dalí is located). More info. - Costa Daurada: is an area on the coast of Catalonia between Cunit and Alcanar on the Mediterranean Sea. It is included in the province of Tarragona, and the most famous places are Salou, Tarragona, Theme Park Port Aventura,... More info.